One of two Gvozdika kits available, the ARMO kit is made entirely from resin. I feel that this is one of ARMO's better kits, considering scale and detail accuracy. The resin is typical ARMO resin, very high quality, with few, if any, defects. About the only part needing repair in my kit is the gun barrel, which is slightly warped. There is a small amount of flash on some of the parts, which is easily removed. The large molding plugs common on older ARMO kits are missing, as it seems that they have now started to inject the resin into the molds, instead of pouring it. The hull and turret are solid, and all hatches are molded shut. I have compared this kit to the scale drawings of the 2S1 within the Russian book, Bronekollektsiya #4/2000 - Soviet Armor 1945-1995, and confirmed it with Jane's Tanks and Combat Vehicles Recognition Guide, and this kit scales out exactly to 1/72d. Some of the smaller details aren't quite correct; for example, the tracks are a bit too wide, and the idler wheels are much too large. In comparison with the ACE 2S1, this kit has some strengths and weaknesses. The details on this kit have a more "hand-crafted" appearance. I'm not going to disparage it, because it's much better than I could do myself, but I feel that the ACE kit has more refined and polished detail. 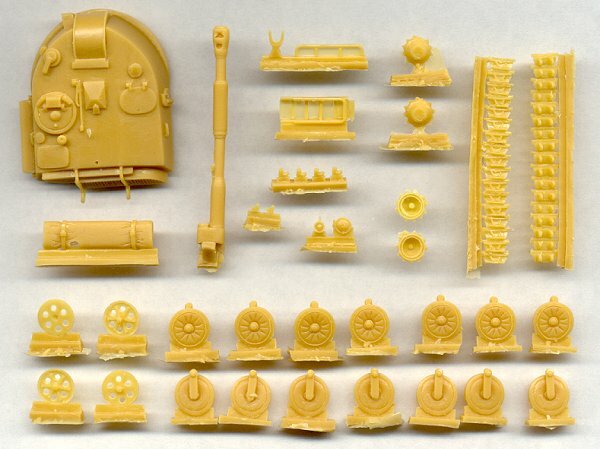 The tracks in this kit are highly detailed, but again, obviously hand-made. I think that once built, painted and weathered, they will look very good. The mesh pattern on the hull is finer on this kit than the ACE kit, and there are also a couple of minor details included on the ARMO kit but missing from the ACE kit, such as bullet-splash guards around some of the hatches. The tow cables molded onto the hull side are really nicely done. As always, the instructions leave a lot to be desired, but the kit is simple enough that a couple of decent photographs should be enough to get by. No decals are included. All in all, this is a very fine kit, and I can highly recommend it.